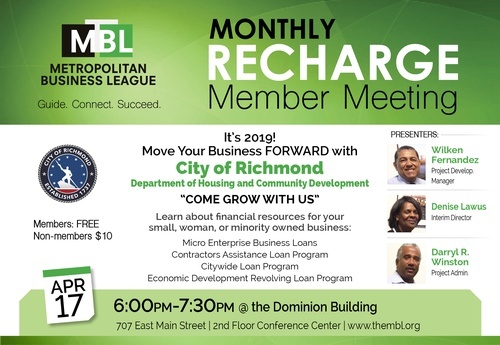 Come learn about financial resources for your small, woman and minority owned business. Denise Lawus is the Interim Director of the City?s recently created Department of Housing and Community Development. Ms. Lawus has over thirty years of economic and community development experience. Her diverse background includes Community Development Block Grant administration, grant management, budget development, contract administration and compliance, business development, and project management. Denise is a native of Philadelphia, Pennsylvania. Ms. Lawus is a graduate of Cheyney University, Cheyney, Pennsylvania where she received a Bachelor of Arts in Political Science with a concentration in economics. She has been with the City of Richmond for over sixteen years. Rick Winston is the Community and Economic Development Administrator for the Department of Housing and Community Development. For two years he has worked in this position for the City. Previously Rick worked for several local banks and has years of experience in assisting small businesses with their financing needs. Rick is a native of Richmond and a product of the public school system. He is a proud graduate of the University of Virginia where he earned a degree in Psychology. Rick continued his education and earned his MBA from Virginia Commonwealth University. Rick married his high school sweetheart nearly 35 years ago and they have four children. Wilken Fernandez is a Program Development Manager of the City?s Department of Housing and Community Development. Mr. Fernandez has over thirty years of experience working with businesses in US and other countries. His background includes Finance, Budget Development and Management, Business development and International Commerce. Wilken Fernandez is a native of Havana, Cuba. Mr. Fernandez is a graduate of University of Havana with a Mayor in Economics. Mr. Fernandez has been working with the City of Richmond for over twelve years.